DBI-SALA™ and Protecta® are #1 in the development of reliable, versatile self-retracting lifelines (SRLs). 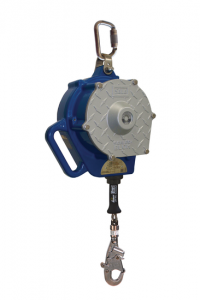 Their innovations include the first retractable lifeline, sealed SRL, RSQ dual-mode SRL, 3-way SRL with built-in retrieval and the impact indicator important safety innovations which have now been widely adopted across the industry. When there is nothing between you and the ground but clouds, it doesn’t make sense to choose another brand. 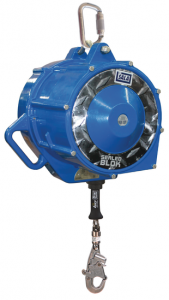 Capital Safety’s SRLs meet OSHA and ANSI standards. At Kennedy Wire Rope & Sling Company, our knowledgeable and trained staff will inspect, repair, reassemble and certify Capital Safety SRLs. When you use us for your lifeline requirements, you’ll be dealing with a company that has more than thirty-five years of experience in this specialist field. We can advise on which type of lifeline is going to be most suitable, as well as provide all related items you need to create a complete lifeline system. Obviously keeping your lifelines in impeccable condition is a vital safety requirement. No matter how many lifelines your operation needs, if you want them to be inspected, tested, maintained and repaired correctly, we can help. Our skilled team is able to provide a full maintenance service on all Capital Safety SRLs, ensuring each one is kept ready for dependable use when required. Our retracting lifelines are suitable for any application where individuals are working at height. Ideal for use in the oil & gas industry, construction work, maintenance work and similar applications, lifelines are also essential for marine applications, search & rescue and other emergency services. We are always happy to advise you on what might be best for your operation – just get in touch and tell us what you need. In addition to our lifeline repair service, we also offer a range of training seminars and on-site repair if required. When it comes to our lifelines, our aim is to offer a comprehensive suite of services which provide everything you need to keep your self retracting lifeline equipment in top condition. To find out more about us or our products, call (800) 289-1445.